Designed to accommodate residential, and small to medium commercial applications, the multi-board product series employs an expandable approach that accommodates up to 1,280 LED light fixtures, 336 wall switches, and 16 motion detectors distributed throughout the subject building. 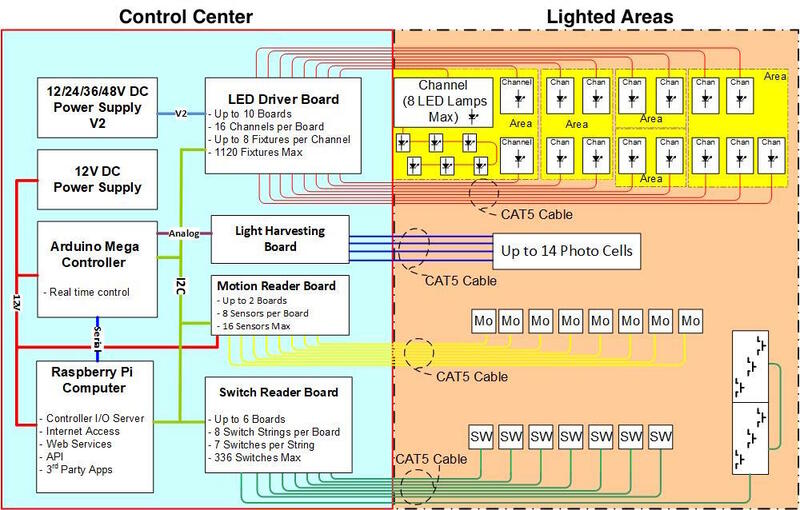 Light fixtures, switches, and motion detectors connect using Cat5, Cat5e or Cat6 cable into a cluster of LED Driver Boards, Switch Reader Boards, and Motion Reader Boards. These circuit boards are all housed in a Control Center along with the PMMI Lighting Controller and PMMI Lighting HUB. Designed to accommodate new builds of small residential (cottages, tiny-homes, RVs, mobile homes) applications, the single-board product series accommodates up to 96 LED fixtures, 14 wall switches, and 2 motion detectors. The PMMI Lighting Single Board Controller, as well as The PMMI Lighting HUB are all housed in the Control Center. LED, Low voltage, PMMI Light Fixtures and wall switches connect into the Control Center through a series of daisy-chained, Cat5, Cat5e or Cat6 cables, therefore providing both power and control. Likewise, motion detectors connect using Cat5, Cat5e or Cat6 cable for both power and control. PMMI Circuit boards, the PMMI Lighting Controller, the PMMI Lighting HUB, and motion detectors are powered using 12V DC. PMMI LED Light Fixtures are powered with either 12V, 24V, 36V or 48V DC. The different DC voltages determine the number of LED light fixtures that can be daisy chained on a single Cat5, Cat5e or Cat6 cable. PMMI has a several different fixtures with different specifications, so for this example we will use the 6.4 watt LED Recessed Downlight by PMMI Lighting in our Single Board Controller System which has 12 channels. PMMI has a several different fixtures with different specifications, so for this example we will use the 6.4 watt LED Recessed Downlight by PMMI Lighting in our Multi Board Controller System which has 16 channels per board. AC/DC power supplies are readily available which accommodate standard 120V AC and 240 V AC line voltage. These power supplies are used as stand alone, or in combination with battery packs that provide backup power in the event of a grid power failure. The system works well for off-grid applications with battery backed solar or wind power. PMMI support can help size and select power equipment for just about any application. PMMI Lighting Systems use Cat5, Cat5e or Cat6 cable with RJ45 connectors for power and control. All PMMI LED Light Fixtures and wall switches connect to the control panel through a series of daisy chained Cat5, Cat5e or Cat6 cables. Likewise, motion detectors connect using Cat5, Cat5e or Cat6 cable for both power and control. Cat5, Cat5e or Cat6 jumper cables are used for inter-board communications. The use of low-voltage cable eliminates the need for conduit hence allowing another significant cost reduction. The PMMI Lighting HUB provides internet connectivity to the lighting system through Ethernet. PMMI support uses internet for installation, diagnostics, configuration, and software updates.